If you walk into our home, you may think that I’m married to a rockstar. The hubs was giving permission to leave his guitar out on display and he recently received an Irish drum from his awesome wife (ah hem) lol. When the hubs was taking guitar lessons back in Chi-town, we used to have guitar picks around the apartment. B’s picks were just boring red from like Guitar Center, so when I saw this gift, I thought it could be good for the hubs! 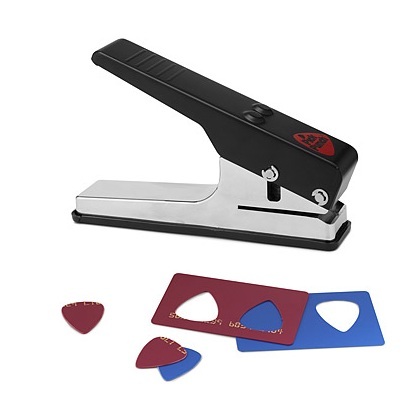 This little fancy device, you can make your own guitar picks from old credit cards, hotel keys or anything plastic. Or carry this with you in your guitar bag to ensure that you always have a pick!